With all the choices you have, it should be no problem finding a vented gas fireplace for your home. If you have a delightfully modern and contemporary style, you might choose the Heatilator Rave Gas Fireplace. Rather than gas logs, this fireplace has stainless steel fire tubes that give it quite the modern look. Or, if your home features a classic, traditional style, the Heatilator Caliber nXt gas fireplace would be a great fit for you. The gas logs in this fireplace are realistic and the interior is brick, giving it a traditional ambiance. Whether you prefer contemporary or traditional fireplaces, the most important part is that you select a vented gas fireplace vs. a non-vented gas firepalce. A direct vent uses a high temperature glass panel to seal off the burn area of the fireplace from the interior of the home. It pulls 100% combustion air to feed the fire from outside the home. Because of its design, a direct vent gas fireplace will not affect the indoor air quality of your home. Since no air from your home is going up the chimney, a direct vent model is very efficient. 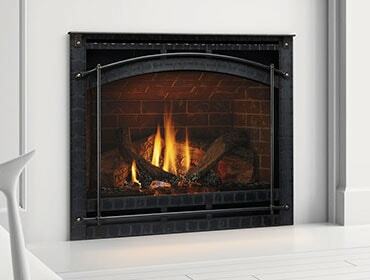 Additionally, vented gas fireplaces have valves that control the gas flow to the fireplace. When the pilot light goes out, the gas turns off. This way, the gas will not build up and create an unsafe environment in your home in case out outage. Often, unvented gas fireplace require the burn temperature to be higher to lessen risk of emissions. The result? A higher temperature burn and less realistic, sometimes even blue looking flame. With a vented gas fireplace, the temperature is controlled, resulting in realistic flames that closely resemble a flame produced from a traditional wood burning fire. With a controlled pilot light and temperature system, you will use less gas with a vented gas fireplace, resulting in lower bills and more cash in your hand. While specific costs vary based on location, utility and fuel type, national averages to run a natural gas fireplaces that consumes approximately 27,000 BTUs/hr will cost less that 20 cents/hr to enjoy! When you are looking for a new fireplace for your home, look for a vented gas fireplace. Available in a wide variety of styles, designs, colors, and sizes, vented gas fireplaces will provide the realistic fire/flame you desire, while also keeping your home and family safe.